The Kakeya problem asks for the smallest convex region in which a unit segment can be moved back to itself but in the opposite direction. 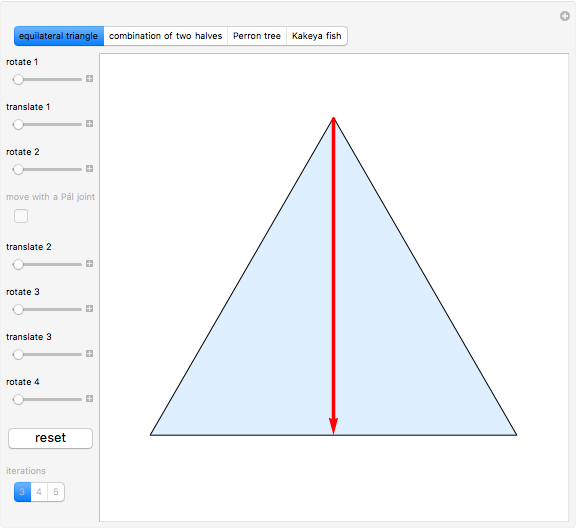 The answer is an equilateral triangle of unit height . 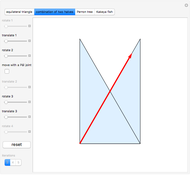 If a nonconvex region is allowed, an area less than the deltoid is possible. As this Demonstration illustrates, there are some for which the area approaches 0. 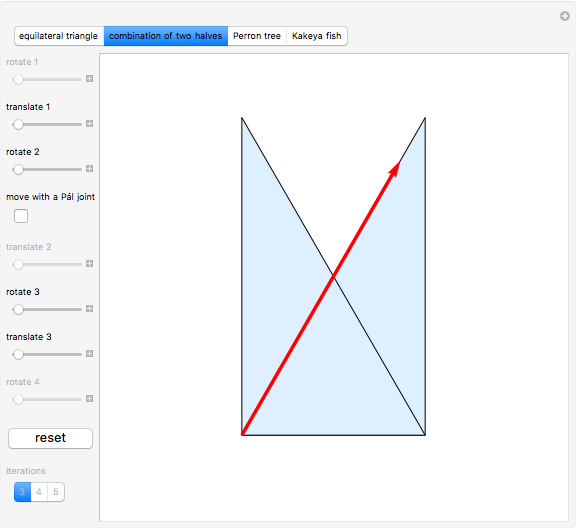 This Demonstration begins by showing how to reverse a segment within an equilateral triangle. 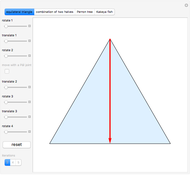 The next region, "combination of two halves", is nonconvex; it has 3/4 of the area of the equilateral triangle plus an arbitrarily small area needed for Pál joints. A Perron tree is formed by dividing the base of the equilateral triangle into equal parts to form thin triangles and then sliding them to overlap as much as possible. 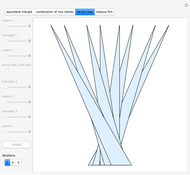 Within a Perron tree, a unit segment can be turned by 60°. 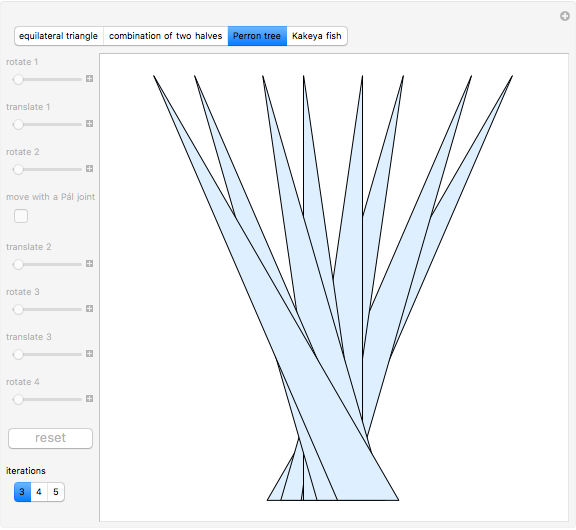 Three Perron trees form a Kakeya fish, within which a unit segment can be reversed . Given two parallel lines, a Pál joint lets you move a unit line segment continuously from one to the other through a set of arbitrarily small area. A Kakeya set (or Besicovitch set) is one that can contain a unit segment in any direction. Using Pál joints, a Kakeya needle set can be created from Perron trees, as indicated in this Demonstration [1, 3 pp. 129–130]. See Besicovitch's talk  and expository article . Wikipedia. "Kakeya Set." (Jun 20, 2016) en.wikipedia.org/wiki/Kakeya_set. K. J. Falconer, The Geometry of Fractal Sets, 1st ed., Cambridge: Cambridge University Press, 1990. D. Wells, The Penguin Dictionary of Curious and Interesting Geometry, London: Penguin Books, 1991. Kakeya's Needle Problem [Video]. (2015). Retrieved June 20, 2016, from www.youtube.com/watch?v=j-dce6QmVAQ. The Kakeya Problem [Video]. (1962). Retrieved July 11, 2016, from av.cah.utexas.edu/index.php?title=Category:The_Kakeya_Problem. A. S. Besicovitch, "The Kakeya Problem," American Mathematical Monthly, 70, 1963 pp. 697–706. Burut Jurcic Zlobec "Kakeya Needle Problem"